Home | Blog | How to Buy Pen Kits From China securely ? How to Buy Pen Kits From China securely ? How to Buy Pen Kits From China securely ? Every body knows that buying pen kits from China is cheaper than other countries. but how to buy online to keep our money safe ? We have two suggestions as below. Actually the two suggstions or tips are suitable to buying any items directly via website , not only pen kits . https is short for “Hyper Text Transfer Protocol over Secure Socket Layer”,Which is the secure version of HTTP, the protocol over which data is sent between your browser and the website that you are connected to. The 'S' at the end of HTTPS stands for 'Secure'. It means all communications between your browser and the website are encrypted. HTTPS is often used to protect highly confidential online transactions like online banking and online shopping order forms. Web browsers such as Internet Explorer, Firefox and Chrome also display a padlock icon in the address bar to visually indicate that a HTTPS connection is in effect. So when a site has https certificate, the website is safe . 2. Buy pen kits at site with SECURE CERTIFICATE . 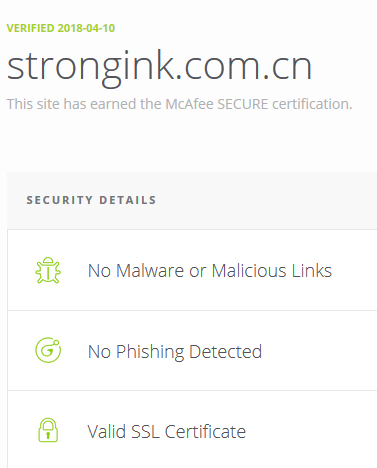 When you click the Secure Mark , for example McAfee , you can see as below , McAfee will tell you the site has earned the McAfee SECURE certification . If you can see above result like above , then you can know the site is safe ,you can pay via the payment method on this site . Because it is protected by McAfee or Symantec company . otherwise you will have risks to loss your money when you pay via a pen kits site . Previous:How to Buy Pen Kits at strongink.com.cn ?